HOUSTON – Ahmad, Zavitsanos, Anaipakos, Alavi & Mensing P.C., or AZA, is recommended as one of the top patent litigation firms in Texas by London-based intellectual property magazine Intellectual Asset Management (IAM) for the fourth year now. “Litigation thoroughbred Ahmad Zavitsanos Anaipakos has successfully resolved disputes across virtually all technologies, industry sectors and forums; its lawyers’ gift for constructing tightly woven and compelling narratives works in any setting,” the magazine wrote. It noted that these two seasoned AZA lawyers are among the very few patent lawyers to be board certified in civil trial law by the Texas Board of Legal Specialization. The magazine polls in-house counsel and other patent attorneys to develop its rankings. “These partners can shoulder an incredible load without it being burdensome and have built a highly sophisticated group around them; the team does not stand on ceremony and everyone is happy to muck in, so clients are never left wanting,” the magazine stated. AZA’s patent and intellectual property practice group has achieved great success representing clients in IP-related cases throughout the world, including Europe, Asia and the Middle East. Languages spoken by IP team members include Arabic, Cantonese, Farsi, French, Mandarin, Russian, Spanish, Ukranian and Urdu/Hindi. The firm regularly handles patent infringement, trademark, copyright, and trade secret cases and was ranked one of the 10 largest IP firms in Houston in 2016 by the Houston Business Journal. AZA patent lawyers have experience in numerous industry sectors including energy, technology, chemistry, biochemistry, telecom, hardware and software, and transportation. 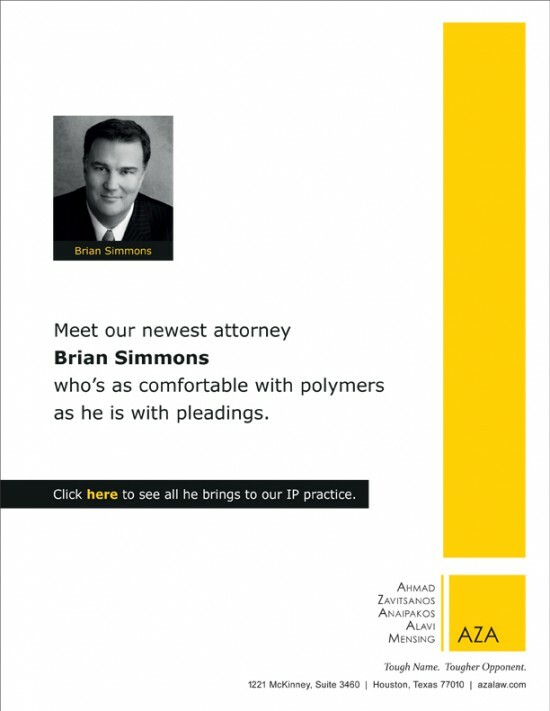 The firm has had success representing both plaintiffs and defendants in IP cases.